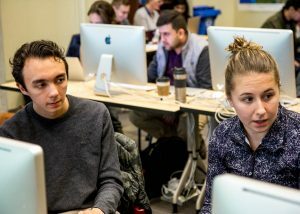 The School of Journalism at the University of British Columbia (Vancouver campus) invites applications for a full-time tenure-track position in the Educational Leadership stream at the rank of Instructor. We are particularly interested in candidates with expertise in contemporary and emerging fields of journalism, complementing the School’s core strengths in digital, international, environmental, Indigenous, social justice, data, non-profit and public policy journalism as listed on our website. The anticipated start date is July 1, 2019. The position provides the opportunity to pursue a career focused on excellence in teaching, curriculum design, and other aspects of educational leadership. It involves a significant educational leadership role that includes, among other things, academic planning, curriculum and program development, and innovation. The position entails a teaching load of six 3-credit courses per year (18 credits). Candidates must have a Masters or PhD degree, with evidence of teaching excellence in the fields of journalism, media and communications. They must demonstrate a record of or potential for high-quality educational leadership, especially in the area of curriculum or program development. They must have experience in the highest levels of professional practice and a track record of collaboration. Candidates must demonstrate the ability to teach a range of courses currently on offer within the School of Journalism and to contribute to areas not currently covered, as well as the ability to participate fully in student supervision and undertake service duties as assigned by the director. The starting salary for the position will be commensurate with qualifications and experience. UBC defines educational leadership broadly, and it may include outreach, curriculum development, pedagogical innovation, and engagement in the scholarship of teaching and learning [see 4.04]). As this is a tenure-track position, the successful candidate will be reviewed for reappointment, tenure, and promotion in subsequent years, in accordance with the Collective Agreement. For a description of the Instructor rank and criteria for reappointment and promotion, visit Faculty Relations. evidence of teaching effectiveness at the post-secondary level (student evaluations, peer assessments, sample course syllabi, etc). Please also indicate your legal status to work in Canada. Please ensure that your browser is compatible with UBC’s Faculty Careers website (list of compatible browsers). In addition, applicants should arrange to have three confidential letters of reference sent directly by their referees, by the below deadline, via email to soj.admin AT ubc.ca, with the subject line “Journalism Instructor 2019”. Applicants should ensure that referees are aware that this is a position in the Educational Leadership stream and should accordingly provide evidence with a focus on teaching and educational leadership. Enquiries may be made to Alfred Hermida, director and associate professor at soj.director AT ubc.ca. Completed applications and reference letters must be received by March 1, 2019.